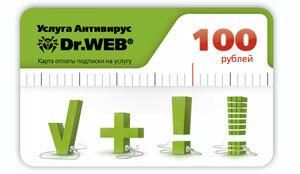 Prepaid card subscription service provider LLC "Soft Systems" par value of 100 rubles. It allows you to replenish the balance of your personal account on that amount and extend your subscription. Suitable for any extension of the anti-virus and software. After payment you will immediately receive the card number and security code to activate in your account.